The colder the months, the more I feel drawn towards cosy, warm scents. I’m not sure how to describe them any better than that, and I’m sure that we all have our own opinion on which fragrance notes constitute “warm and cosy”, but I hope you know what I’m getting at. Deeper, more exotic, spicier. It’s difficult to talk about perfumes without resorting to worn clichés, so I think the best thing to do is have a little perfume session next time you’re in town and let me know what you think! I’m always absolutely intrigued to know what other people think of certain perfumes – it’s such a personal, subjective thing. I saw a woman in Harrods the other day and she was wearing about twenty thousand pounds worth of accessories. (Just my quick calculation on her bag, scarf and watch alone.) Her perfume was FOUL! No doubt it was some ridiculously expensive fragrance by a world famous “nose”, but jeez. I had to move away. Now, this woman likes her scent. She must do. So it’s interesting, is it not, that we all have such different tastes? Have a little watch of the video, let me know your fragrant thoughts. 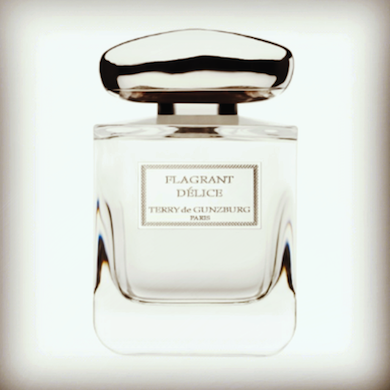 My favourite of the moment is Terry de Gunzburg’s Flagrant Délice, it’s just divine. Deep, figgy, amazing. Terry is the very same Terry of the By Terry fame, so I knew her perfumes would be corkers too. They have only just recently landed at Harrods – there’s a link below the video pane. One more important thing for those who can’t be bothered to watch the video (I know who you are, you ‘orrible lot!) and that’s the gorgeous Jimmy Choo shoe case. Free with every purchase of 60ml or over (the Eau de Parfum is a UK bestseller), it’s a pretty little shoe case that reminds me so much of the ballet cases we carried when I was a child. Get in there quick if you want one – I think that most big department stores are carrying them. Okey dokey people, here’s the vid! If you can’t see the box that plays it, you can simply click HERE to load it up! Gift Shoe Case is free with 60ml or over purchase in selected department stores. Check your local one! Jo Malone Vlevet Rose & Oud: OMG! Has gone. If you find this in a store, get it – it’s amazing! Next Post Adult Acne Skin Woes!